OLLI at Duke is fortunate to have Julia Rose as an integral part of the curriculum. She teaches strength training classes, and her love of movement is contagious say those who faithfully take her classes year after year. Julia has taught fitness since 2006 making her one of the few instructors who have taught 50+ classes for OLLI. In 1995, Julia moved to the Raleigh-Durham area as a single mother, after consulting the book Fifty Fabulous Places to Raise Your Family. “I needed a new beginning and was attracted to the moderate climate. The area had a fascinating cultural, literary, and educated mix with a Southern vibe that intrigued me.” She arrived with a young daughter and soon secured a job as a schoolteacher. Teaching was something she always wanted to do; her mother was a teacher and Julia knew from an early age that it was to be her calling. “I remember as a young girl corralling my brothers and sisters in front of my blackboard teaching them everything from reading to song and dance.” She was a natural teacher, her skills intrinsic. Her experience teaching elementary and middle school, in both public and private school, equipped her well for her second career of teaching movement. 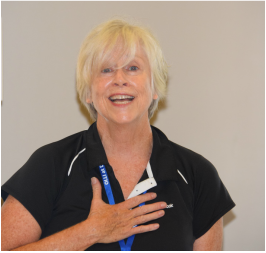 A certified personal trainer, Julia is constantly updating her knowledge, honing her skills, and renewing her thinking to meet the needs of her OLLI students. She teaches fitness at the Durham YMCA, shares her expertise with clients privately, and most recently teaches resistance training to small neighborhood groups and water aerobics at some of the clubs in the area. It is clear that she loves movement and sharing her enthusiasm with others. Her certifications are impressive. 1. Personal Trainer with the American Council on Exercise (ACE) and gets recertified every two years. 3. Total Body Resistance Exercise (TRX) trainer and core specialist. 4. Group fitness with AFAA. Over time, her classes have evolved depending on the needs of her students. Her first class, one that has survived the test of time, was entitled WOW-Women on Weights. She also teaches Strength & Power for 50+ and Core Curriculum. Research suggests that strength training slows age-related muscle loss, increases bone density, and produces a beneficial protein in the brain. “Exercise can be an anti-depressant,” Julia said. “I love it when I see the spirits of my students improve and their posture become more erect”. As they move, they are reminded of their younger selves. And with exercise, they can continue a lifestyle we are all reluctant to relinquish as we age.